The great power of Richard Strauss’ “Elektra” lies in the transmogrification of a timeless tragedy through harrowing vocal music reinforced by an orchestral score so vivid, so nearly verbal, that it might stand alone as a symphonic drama. The magnificence of Lyric Opera of Chicago’s current production resides in the depth of its humanity – that depth sounded by tremendous vocal performances and orchestral playing, under Donald Runnicles, that is absolutely graphic. 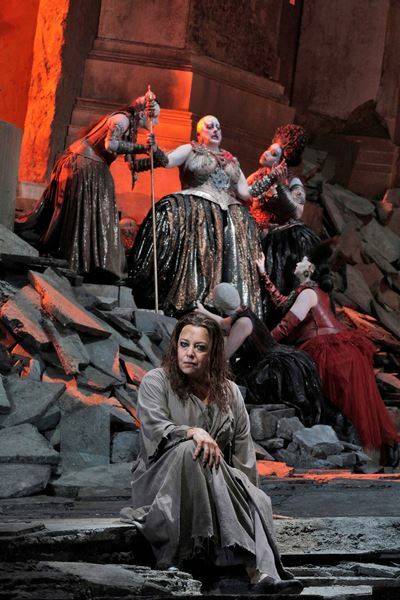 While Klytämnestra (Michaela Martens, top center) suffers from nightmares of guilt, her daughter Elektra (Nina Stemme, foreground) awaits the hour of her death. “Elektra” is, frankly, a hideous tale of family dysfunctionality unmatched in its destructiveness even by the likes of Shakespeare’s “Hamlet” or O’Neill’s “Long Day’s Journey Into Night.” It is the latest chapter in an ancient narrative of betrayal, slaughter, guilt and anguish; to all this, “Elektra” applies the balm of sweet, bloody retribution. In this psychologically fraught Greek legend, Elektra, daughter of Agamemnon, king of Argos, grieves for her dead father, murdered by her mother Klytämnestra and her lover Aegisth the instant Agamemnon returned home from the 10-year campaign of the Trojan War. While her sister Chrysothemis has remained loyal to their mother and enjoyed the palatial comforts of home these seven years, Elektra, ceaselessly railing against the murderers of her father, has been cast into the barn, to eat and sleep with the beasts she now resembles. There she simmers – and waits for her brother Orest to return from exile and wreak vengeance on her faithless mother and the vile usurper Aegisth. To capture the story’s searing climate and emotions, Strauss, writing in the first decade of the 20th century, embraced a stylistic range that at times harkens back to his tonally centered symphonic poems like “Death and Transfiguration.” Yet more often the music surges into a fiercely atonal idiom that anticipates Alban Berg’s “Wozzeck,” composed some 15 years later. The predominantly anguished vocal writing for Elektra demands a singer who can summon real power while delivering those jagged lines with accuracy – but one who also can switch into long-lined, soulful singing at the first hint of hope. Lyric’s production enjoys just such a rare artist in the Swedish soprano Nina Stemme, surely the preeminent Elektra in the world today. 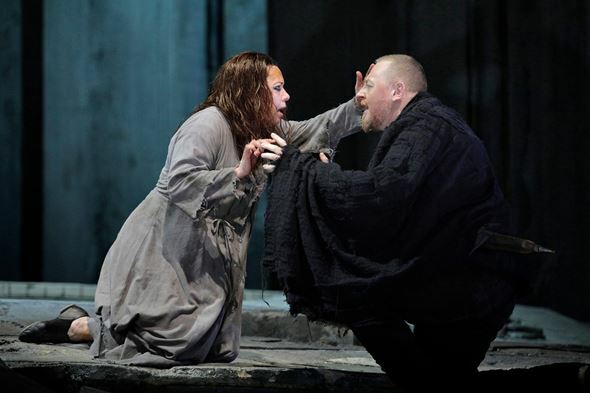 Elektra (Nina Stemme) is ecstatic upon recognizing her long-absent brother Orest (Iain Paterson), returned to carry out the vengeance they both seek. What’s so persuasive altogether about Stemme’s portrayal is its rational contour, its human plausibility, expressed not only in the splendor and savagery of her voice, but also in her carefully gauged physicality. This is the portrait of a real woman, distraught, tormented, broken-hearted. Stemme’s aggrieved princess is single-minded, perhaps obsessive, though I’d rather say hell-bent. Elektra is not the reincarnation of Strauss’ really screwed-up kid Salome, who lusts after Jochanaan’s body – or any part of him she can get. By herself, Elektra is powerless; she can do little more than seethe and rend her garments. So she hopes and prays for Orest’s return; she has even stashed away an ax for him. Is she Lizzie Borden? Stemme compellingly shows us something else: a father’s avenging angel. In the supercharged role of Elektra’s primal enemy, her mother Klytämnestra, is mezzo-soprano Michaela Martens, who rises above a lamentable costume that makes her look like a runaway from some 1930s Berlin cabaret: bald head, huge breasts, garish garb. 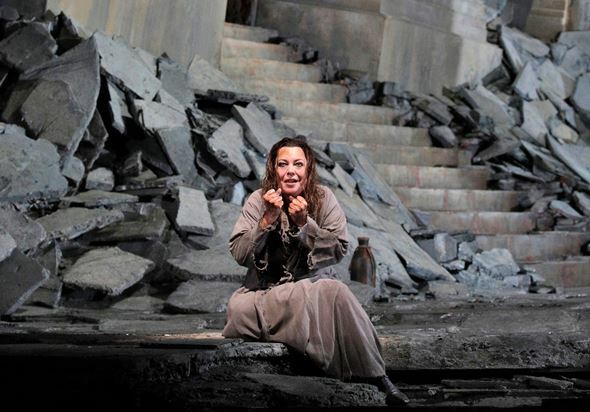 Elza van den Heever, as Elektra’s sister Chrysothemis, delivered Strauss’ blossoms of lyricism. Despite her cartoonish appearance, Martens brings authority to the formidable vocal demands of Klytämnestra; what’s more, she projects credible pathos: The queen is guilty and she knows it better than anyone. She even turns to Elektra for comfort and counsel when she can’t sleep. Though at bottom a bitter confrontation, that scene also invoked a touching remembrance of better times between mother and daughter. If Strauss heaped vocal fury and distress on Elektra and the queen, he bathed the other daughter, Chrysothemis, in blossoms of lyricism. 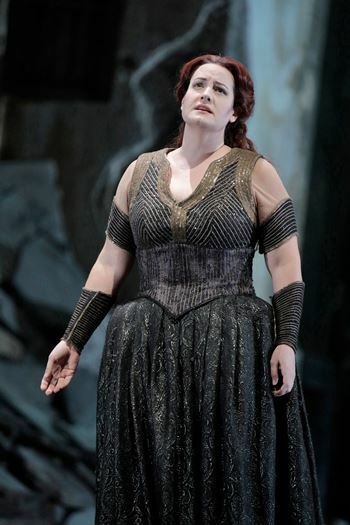 The South African soprano Elza van den Heever sang eloquently, beautifully; she also made a vital dramatic contribution, showing Chrysothemis to be a loving, concerned sibling, not a self-centered Barbie doll who might spend long afternoons accessorizing. The only two men who really matter could hardly be drawn in sharper contrast. Bass-baritone Iain Paterson is a forthright, vocally splendid Orest; tenor Robert Brubaker’s Aegisth, however, is victimized by the same peevish costuming god that abused poor Klytämnestra. Is he in drag? This is the Lyric’s fetching 2012 production: Agamemnon’s palace fallen into disrepair, the walls pitched forward, the whole scene dark, twisted, sickly. But out of the pit rises a sumptuous display of color, the Lyric Opera Orchestra summoning Strauss’ painterly score as if to its finest brushstroke.